THEN! On to the main reason for our trip! 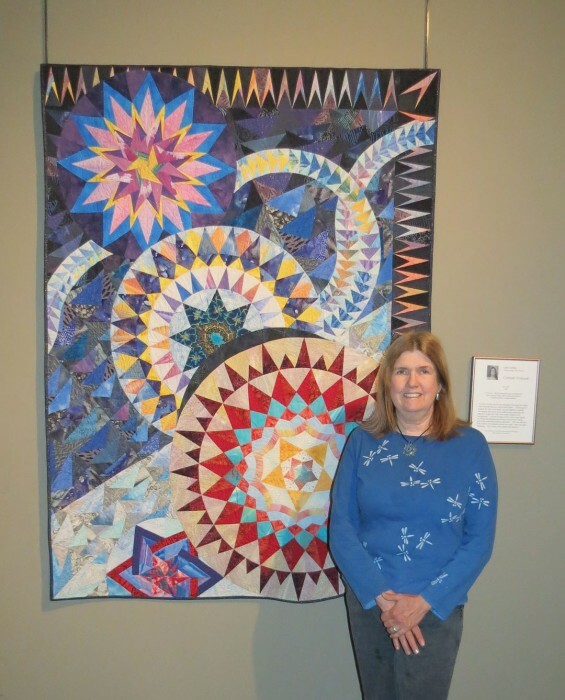 The National Quilt Museum in downtown Paducah – where two of my quilts are proudly hanging. 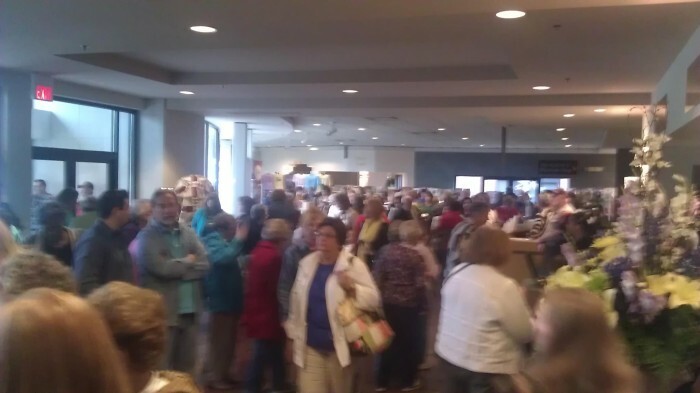 This weekend is the big American Quilter’s Society Show, when the Museum and everything else in Paducah is mobbed! But we were there one week prior when all was quiet. Here’s what it looks like this weekend. I snagged this image from their Facebook page. It was titled “Random photo of the Museum Lobby at 10:00 a.m. It makes me really appreciate the peaceful aura that pervaded the previous Saturday. Here we are posing in front of Azimuth, the largest quilt I’ve ever made. It was entirely hand stitched between 1984 and 1989, and an original design measuring 110″ x 110″. I can think of no greater honor than for it to hang in the National Quilt Museum. Although photos are not allowed in the museum, the curator kindly let me take photos of Azimuth and Cosmic Parade. I just love the way they hang side-by-side, showing my early work and my later art quilt style. 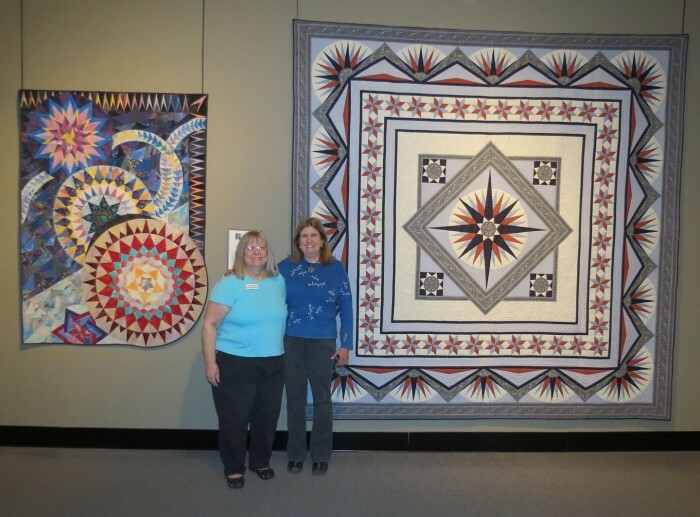 Museum Curator, Judy Schwender and me with my quilts. Curator, Judy Schwender, gave us a personal tour of the collections on display. With about 450 quilts in the permanent collection, each is handled only with gloves and packed carefully into an acid-free box with acid-free tissue padding the fold when they are not on display. It was surprisingly emotional for me when I saw them both hanging in the main gallery, each carefully lighted so all the quilting shows up. It was then that I truly realized I would never again be able to touch them that I nearly burst into tears (of pride). 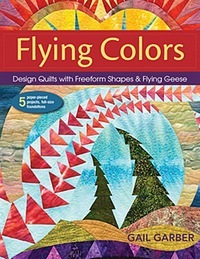 I am so happy that they will be properly cared for and appreciated by quilters for years to come. We spent the whole afternoon at the museum. My quilts are in very good company; some of the best quilt artists in the world have their work displayed there. Special exhibits right now include the quilts of Emiko Toda Loeb and Regina Alexandra. Emika Toda Loeb’s complex quilts are composed of Log Cabin blocks and are usually two-sided. Regina Alexandra quilts reflect the spare sensibilities of the Modern Quilt Movement. Another special exhibit is the “Oh, WOW, Collection of miniature quilts.” We did say “Oh, Wow!” more than once. Another gallery featured new quilts from an old favorite – Jacob’s Ladder. There also was a carved wooden quilt by Fraser Smith that was so realistic, none of us believed it was wood until we saw the back. You must check out his work! 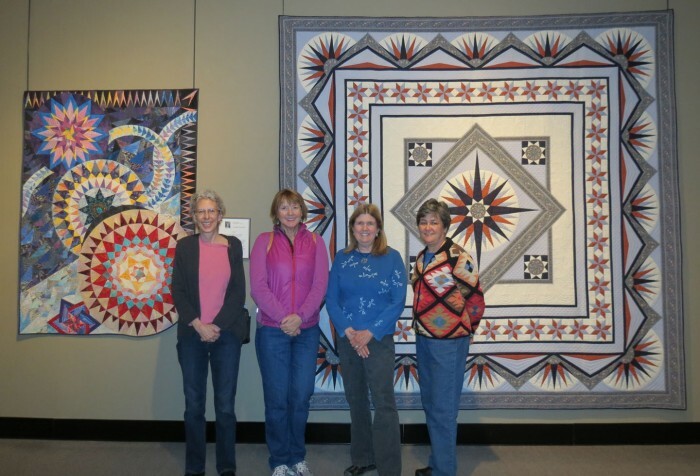 In short, the National Quilt Museum is definitely a must-see destination for all quilters. I am glad that my work is a part of the collection. Congratulations, Gail! Wonderful, well deserved honor. Thank you Rhonda! I am happy that you like Azimuth. My inspiration for this quilt was “Ray of Light Medallion” by Ginny Beyer. I designed this over the course of several years, stitching the quilt entirely by hand. Sadly, there is no pattern for this quilt as it was designed specifically for the border fabric used in the quilt.